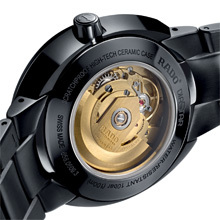 Diverse wearer tastes will find satisfaction in the comprehensive Rado D-Star Collection. 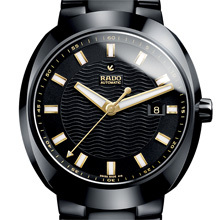 This family of 28 different models makes a proud nostalgic reference to its prominent Rado DiaStar ancestors, for example through hands moving underneath the large indexes. A symbolic anchor enhances all models of the range, which integrates a selection of modern movements and three futuristic materials – high-tech ceramic, Ceramos® and carbon diffused steel. The sharp, angular lines of the striking case are set to contribute to its status as an icon in the making. This black high-tech ceramic watch with an automatic movement makes a bold statement, teasingly punctuated by the luminous white hands and indexes. 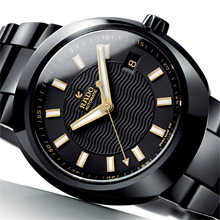 It celebrates the unique shape of the range with over-sized dimensions, plus the Rado trendsetting role in the now huge popularity of black watches.